↑ Որոշ պատմաբաններ պատերազմի սկիզբ են համարում Պորտուգալիա ֆրանկո-իսպանական ներժուժման թվականը (Glover 2001, p. 45). ↑ Ֆրանսիայի ու Վեցերորդ դաշինքի միջև (Glover 2001, p. 335). ↑ Blaze, Elzéar (1995). Haythornthwaite, Philip J., ed. Life in Napoleon's army: the memoirs of Captain Elzéar Blaze. Greenhill Books. p. 102. ISBN 1853671967. ↑ Churchill, Winston (1958). A History of the English-speaking Peoples: The age of revolution. 3. Dodd, Mead. pp. 257, 260. ↑ 6,0 6,1 6,2 6,3 6,4 6,5 6,6 Rodríguez, Alicia Lastra (1956). 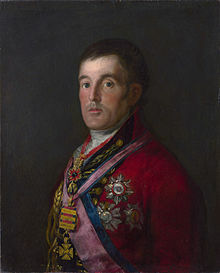 "Buscando a mi general: el periplo asturiano de Andrew Leith Hay en 1814". Archivum (in Spanish). Universidad de Oviedo. pp. 219–247. GGKEY:T6X2X3HZ2PQ. ↑ 7,0 7,1 7,2 7,3 7,4 7,5 Clodfelter, M. (2017). Warfare and Armed Conflicts: A Statistical Encyclopedia of Casualty and Other Figures, 1492-2015 (4th ed.). Jefferson, North Carolina: McFarland. ISBN 978-0786474707. ↑ 8,0 8,1 8,2 8,3 8,4 8,5 Gates, David (2002) . The Spanish Ulcer: A History of the Peninsular War. Pimlico. ISBN 0-7126-9730-6. ↑ 9,0 9,1 9,2 9,3 9,4 Gurwood, J., ed. (1852). "Wellington to Liverpool, 14 November 1809". The Dispatches of Field Marshal the Duke of Wellington, K. G. During His Various Campaigns in India, Denmark, Portugal, Spain, the Low Countries, and France: France and the Low Countries, 1814–1815. III. London. ↑ 11,00 11,01 11,02 11,03 11,04 11,05 11,06 11,07 11,08 11,09 11,10 11,11 Gurwood, J., ed. (1852b). "Wellington to Liverpool, 21 December 1810". The Dispatches of Field Marshal the Duke of Wellington during his various Campaigns in India, Denmark, Portugal, Spain, the Low Countries and France from 1789 to 1815. VII. London. Урланис, Борис Цезаревич Войны и народонаселение Европы. — М.: Соцэкгиз, 1960. Gaston Bodart Losses of life in modern wars. Austria-Hungary; France. — London, 1916.